1. Read all the instructions before beginning. 3. The bag in photo was made using Patons Classic Wool and some hand dyed Lion Brand Fishermen’s Wool. 4. When I used Patons Classic Wool and Patons SWS, the SWS ran out a few stitches before I completed the 6th section of contrasting yarn. I just changed over to the main color and continued with the pattern. After felting it wasn’t really noticeable. Weave in ends. When felting it isn’t necessary to be neat when weaving in ends. After felting you can trip off any nubs. Round 1: With I hook ch 2, 4 sc in second chain from hook. Do not join. Round 2-until 84 inches long: Sc in back loop of next sc. Continue working sc in back loop until cord is 84 inches long. You will be working from the inside of a tube. Fasten off leaving a 4 inch tail. Weave tail through the 4 sc and pull snug. Tuck tails inside cord. You can now felt the bag and cord. Put the crocheted bag into a zippered pillow case. This is necessary to protect the pump in your washing machine. Put the pillow case and a couple pair of old jeans into the washing machine on “hot” cycle, small load, fastest agitation. Add a very small amount of liquid dish washing soap (not dishwasher soap). Let the machine agitate for 10 minutes. Stop the machine and check the progress of the bag. If it’s still too big, reset to the beginning of the wash cycle. Recheck it every 5 minutes, as it can felt in a hurry at this stage. Don’t let the washer spin. It takes 16 minutes in my washer. But times vary by machine and water temperature. Remove the bag from the machine and rinse in a sink with cold water. Squeeze as much water out as possible without wringing. Wrap in a towel to absorb excess water. Then shape it as you desire. I block mine by lining the bag with plastic bags and filling with raw beans. Here’s what I do; place the bag on a dry towel, and put three bags inside each other and inside the bag. I use three because sometimes those Wal-Mart bags have holes in the bottom. I figure three of them will keep the beans inside the plastic bags not against the wool. Fill the bags, inside your bag, about half full of raw beans. Putting your fingers through opposite loops, bounce the bag up and down a few times to compact the beans. Go all the way around bouncing with your fingers in all the loops. Keep adding beans and bouncing until it is full all the way to the upper edge. Change the towel to a dry one. Now wait for the bag to dry. When dry, trim any loose ends. Weave the cord in and out of the loops and tie ends in an overhand knot. YOu have some really cutes stuff here. I also live in Bellingham ;D Small world. OMG! I recently discovered your blog and I made this felted drawstring bag....took it to work and a co-worker 'had' to have it! I've crocheted the second and plan on making more as gifts....thanks for the great design(s)!!! Hi! I made my first bag from your website! I love it, turned out perfect. But I have a termonology question, what exactly does "welt round" mean? Welts are a raised set of rounds that when felted makes a welt. A welt round is a round that closes the set of rounds. I love this bag but would like to make it as the felted size without felting. Can you post a modification in the pattern to obtain this? 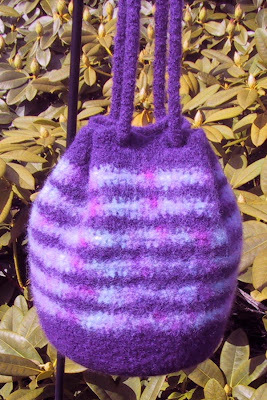 This is the non-felted version, but be warned it is a completely different sort of bag. Felting supplies structure which the non-felted does not. I really like your site. I plan to make the sleep sack and ruffle cap. My sleep sack patterns are all written for knitting in the round. You can't do that without using a circular or double point needles. Time for you to learn to knit with a circular needle. Just be sure to use the correct length. A casing is usually folded over to make a "tube" to run elastic or ribbon through. Like my diaper cover patterns.